North Carolina's longest trail, the North Carolina Mountains to Sea Trail, is an ambitious project to provide a foot path linking the Mountains in the West to the Coastal Plain in the East. The trail, when completed, will be over 900 miles in length. Fog along the Hunt-Fish Falls trail, which is co-signed as the Mountains to Sea Trail at this point. 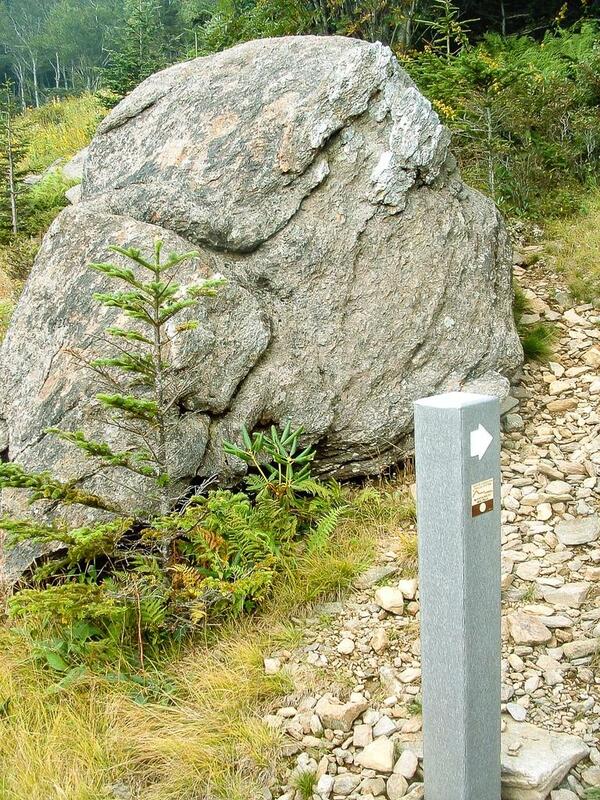 These posts mark access points to the Mountains to Sea Trail, carrying the characteristic white blaze and trail logo. Look for them along the Blue Ridge Parkway. Starting at Clingman's Dome (the highest point in Tennessee and the Great Smoky Mountains National Park), this trail boasts many superlatives. It travels over Mount Mitchell (the highest mountain in the entire Appalachian chain), and through Jockey's Ridge State Park (the highest sand dune on the East Coast). It's also the longest trail in the State, and one of the longest in the Appalachian region. The footpath is nearly complete in the western part of the state - the mountains - and includes many sections that make for excellent day hikes. It stretches unbroken from near Maggie Valley, NC all the way to Stone Mountain State Park north of Wilkesboro. Only a short stretch near the Smoky Mountains has yet to be routed. For now, only sections of foot path are completed farther east, and these footpath sections are linked with roads and state bicycle routes to form the entire route. As the trail heads north and then east from Clingman's Dome through the mountains, it exits the Western NC region at Hanging Rock State Park. Our information about the trail ends there. In various contexts, you may hear the trail referred to as the "MST" or "MTS Trail" in lieu of its longer, more formal name. In the past, the trail was unofficially divided into 22 sections in the Western part of the state, varying from about 8 - 30 miles per section with an average of about 20 miles each. These sections were first imagined by Allen de Hart in the late '90's, and published in his book "Hiking North Carolina’s Mountains-to-Sea Trail" (UNC Press, 2000). More recently, the Friends of the Mountains to Sea Trail - the non-profit group which now acts as the trail's official stewards, more or less - has divided the trail into 7 sections over the same stretch. These divisions are the basis for their fantastically detailed MST Trail Guide publication. So, we're switching our own descriptions to align with these same 7 sections in Western NC. Bear with us as we update materials to reflect the change! Other sources may publish different "segments" of the trail, and of course we suggest much shorter portions of the trail for day hikes in our own Best Hikes. Ultimately, however you divide it, it's all the same trail! While driving the Parkway and hiking in North Carolina's State Parks, look for the distinctive signpost (shown above) and a trail with circular white blazes to identify the Mountains to Sea Trail. The MST meets up with the Parkway in many spots - often overlooks - which make great jumping-off points for your hikes. 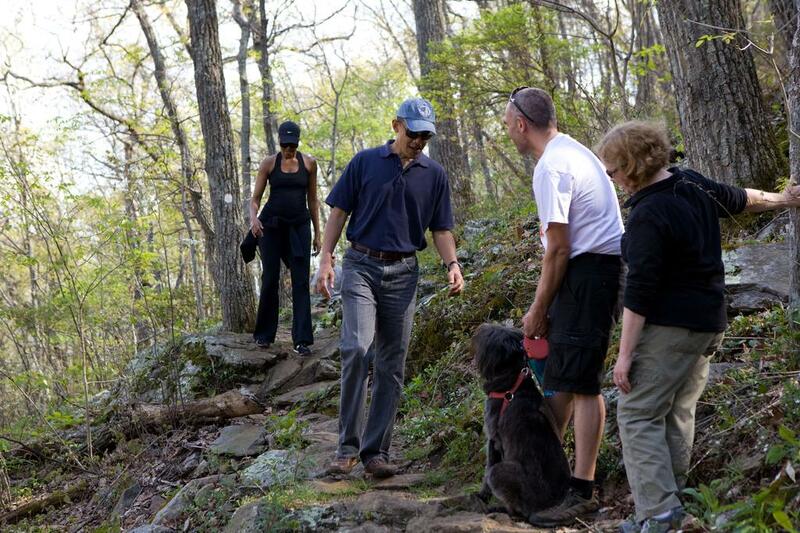 The Obamas hiking a section of the Mountains to Sea Trail near Asheville. The Mountains to Sea Trail is an important connector for a number of day hikes, which we feature in the Hikes section. Each hike has all the details you need to make a complete trip featuring an exemplary segment of the Mountains to Sea Trail. We also provide a list of Short Hikes Near Asheville which use the Mountains to Sea Trail - perfect for after-work hikes, or shorter hikes when you don't have a lot of time to drive. This is just an overview of the trail. For all the trail details, see the Trail Details page. You can see photos in the Mountains to Sea Trail Hiking Gallery, and maps on the Maps Page. 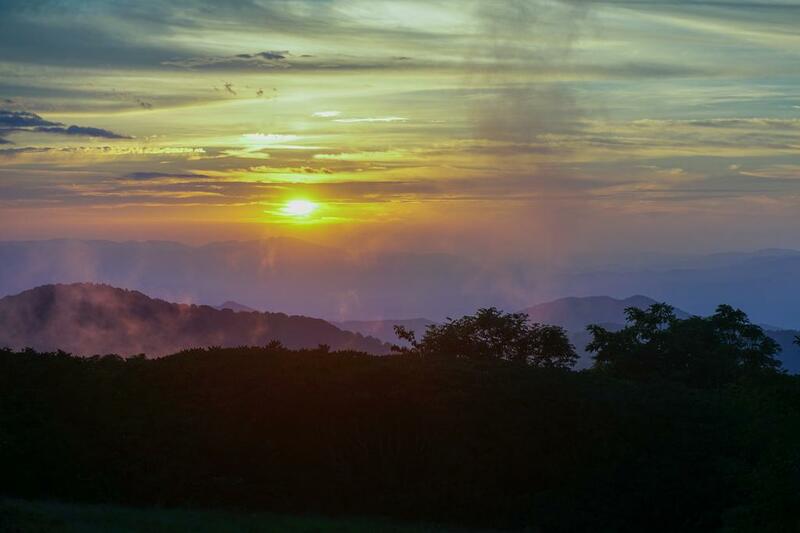 Sunset as seen from Craggy Gardens as wisps of clouds rise from the ridgetops. While through-hiking the Mountains to Sea Trail is possible, this site focuses on shorter hikes featuring segments of the trail - possibly linking with other trails as well. 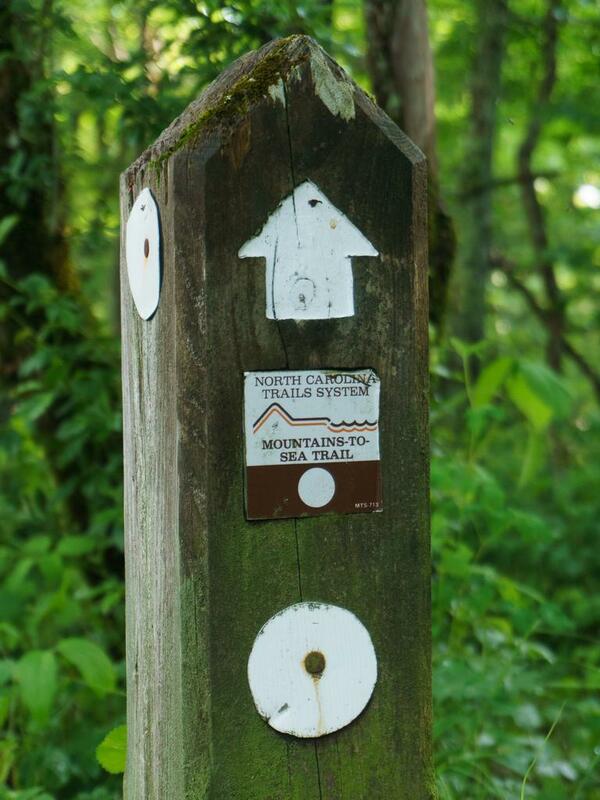 For information on through hiking, visit the Friends of the Mountains to Sea Trail's web site. 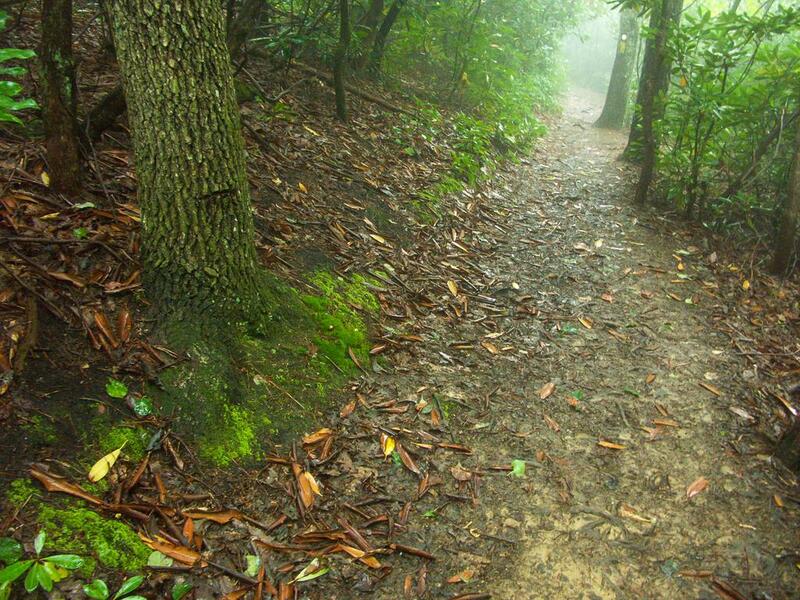 The Mountains to Sea Trail along the Blue Ridge Parkway have now been officially designated as a National Reacreation Trail by the US Secretery of the Interior. Find out more in the American Trails database!